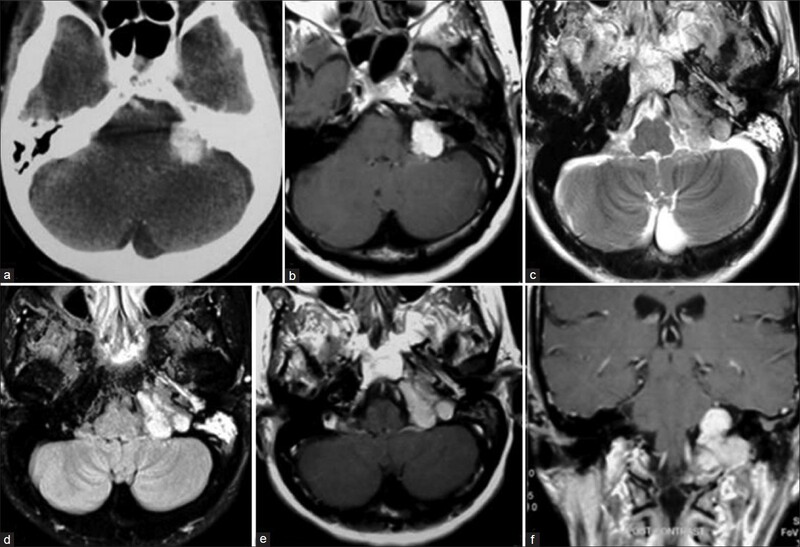 Paraganglioma is a rare tumor of the cerebellopontine angle. We report a case of a 55-year-old female presented with otalgia and decreased hearing in the left ear, hoarseness of voice, difficulty in swallowing, nasal regurgitation, and tinnitus. The tumor was excised by left retromastoid and posterior fossa craniectomy approach. Intra-operative crush smear and histopathological examination revealed a paraganglioma. Post-surgery the patient was treated with fractionated radiotherapy. A 55-year-old female presented with complaints of ear pain and decrease hearing in the left ear of 1 year duration, and hoarseness of voice, difficulty in swallowing, nasal regurgitation, and tinnitus for last 3 months. Otological examination showed congested and bulged left tympanic membrane on its antero-superior surface and infero-posterior surface. Pure tone audiometry showed left sided profound sensorineural deafness. Neurological examination revealed fasciculation and wasting of the left side of the tongue with slight deviation to the right side, left vocal cord palsy and deficits in eighth, ninth, tenth, and twelfth cranial nerves. Computed tomography (CT) of the brain shows a hyperdense and contrast enhancing lesion in the left CPA with erosion of the petrous temporal bone [Figure 1]a. Magnetic resonance imaging (MRI) of the brain showed homogenously enhancing lobulated, extra-axial, altered signal intensity lesion in the region of left CPA and extending into jugular foramen (pars nervosa compartment) eroding the basi-occiput, engulfing the left internal carotid artery antero-inferiorly and abutting the left sigmoid sinus posteriorly. The lesion was measuring 22 mm × 17 mm in the left CPA cistern and 23 mm × 31 mm in the jugular foramen. The lesion was isointense on T1, iso-to slightly hyperintense on T2 [Figure 1]c weighted images, brilliantly enhancing on contrast [Figure 1]b, and hyperintense on fluid attenuated inversion recovery [Figure 1]d sequence. Mild restriction was seen on diffusion weighted imaging. The lesion in the left CPA region lesion was abutting and partially engulfing the seventh and eighth cranial nerve complex. The radiological differential diagnosis was paraganglioma and non-acoustic schwannoma. The patent underwent left retromastoid, posterior fossa craniectomy and exploration and excision of the tumor. Per-operatively the tumor was well-encapsulated, yellow in color and lifting the lower cranial nerves, and not arising from them. The tumor was highly vascular. Debulking of the tumor was done. Crush smear for intra-operative consultation showed small- to medium-sized tumor cells with fine to coarse chromatin, and moderate amount of fine cytoplasm, arranged in dyscohesive sheets, clusters with insinuating capillaries, and singly scattered pattern [Figure 2]a: Rapid H and E, ×100]. Interspersed small cell with hyperchromatic nuclei were also seen [Figure 2]b: Rapid H and E, ×400]. 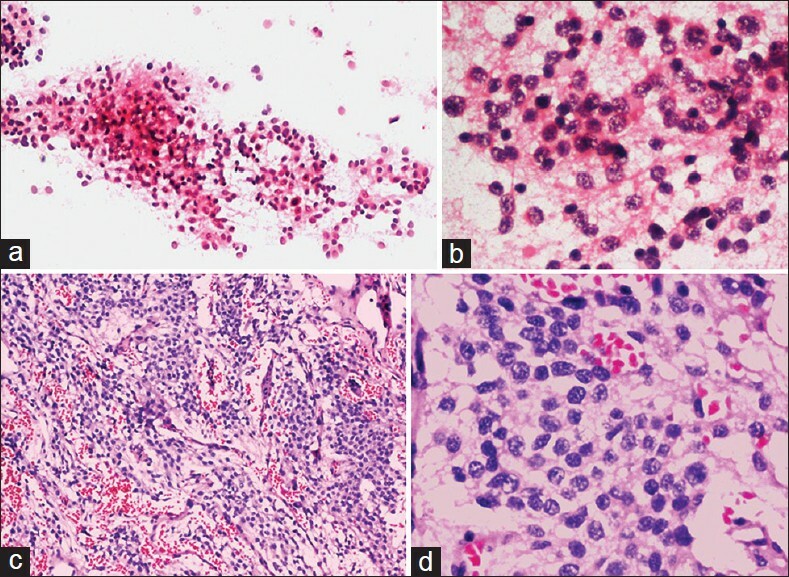 The cytological features were consistent with paraganglioma. Microscopic examination of the paraffin embedded sections showed medium-sized tumor cells having fine to coarse chromatin, and a moderate amount of fragile cytoplasm [Figure 2]d: H and E, ×400] arranged in nests or zellballen pattern [Figure 2]c: H and E, ×100], rimmed by small to spindle-shaped cells with dark nuclei [Figure 2]d: H and E, ×400]. Numerous congested capillaries were seen in the tumor stroma [Figure 2]c: H and E, ×100]. The histological diagnosis was paraganglioma. Surgery was followed by radiotherapy with 50 Gy in 25 fractions over 5 weeks. There was a significant improvement in the lower cranial nerve palsies. Presently, 1 year after surgery there is no recurrence of tumor. The review of literature by PubMed search (as on 26 th December 2012) shows that the first case of CPA paraganglioma, was reported by Erasmus in 1947,  following which less than twenty cases have been reported. The prevalence of paraganglioma is low, accounting for only 0.6% of neoplasms of the head and neck region, with male preponderance (female to male ratio of 4:6.1) for jugulo-tympanic tumor, and maximum incidence in the fifth and sixth decades. The classical evolution of this benign but locally aggressive tumor, is local invasion, follow paths of low resistance towards mastoid cell tracts, vascular channels and Eustachian tube More Details, destruction of the petrous bone, invade the CPA. Hence, paragangliomas of the CPA arise from minute bodies present in the jugular foramen along the vagus nerve (glomus jugulare tumor) or along the Jacobson nerve on the promontory of the middle ear (glomus tympanicum tumor). Cytologic examination reveals medium polygonal, ovoid or elongated tumor cells are, which are either isolated or in loosely arranged groups or form rosettes. The cytoplasm is moderate to abundant, granular or dense eosinophilic on hematoxylin and eosin, and is pale on Papanicolaou stain. Red cytoplasmic granules are seen in Giemsa stain. The nuclei are round, centrally or eccentrically located and show considerable variation in size and shape, with granular chromatin. Rare intranuclear cytoplasmic inclusions are seen. However, the cells in schwannomas are more spindled, arranged in fascicles, and tight clusters, having elongated, slender and wavy nuclei and focally show nuclear palisading. In meningiomas, the cells are medium-sized polygonal cells arranged in tight clusters, whorls or singly scattered, with oval, clear nuclei and psammoma bodies. 1. Glenner GG, Grimley PM, Tumors of the extra-adrenal paraganglion system (including chemoreceptors). In: Firminger HI, editor. Atlas of Tumor Pathology. Series 2, Fascicle 9. Washington: Armed Forces Institute of Pathology; 1974. p. 1-90. 2. Erasmus JF. Carotid body tumour with invasion of the cerebello-pontine angle. S Afr Med J 1947;21:225-7. 3. Moffat DA, Ballagh RH. Rare tumours of the cerebellopontine angle. Clin Oncol (R Coll Radiol) 1995;7:28-41. 4. Bonneville F, Sarrazin JL, Marsot-Dupuch K, Iffenecker C, Cordoliani YS, Doyon D, et al. Unusual lesions of the cerebellopontine angle: A segmental approach. Radiographics 2001;21:419-38. 5. Ardeleanu C, Dãnãilã L, Arsene D. Paraganglioma of the cerebellopontine angle. Case presentation and pathological considerations. Rom J Morphol Embryol 2005;46:171-4. 6. Szyfter W, Kopeæ T, Kawczyñski M. Glomus caroticum, jugulare and vagale: Problems in diagnosis and treatment. Otolaryngol Pol 2006;60:305-12. 7. Olsen WL, Dillon WP, Kelly WM, Norman D, Brant-Zawadzki M, Newton TH. MR imaging of paragangliomas. AJR Am J Roentgenol 1987;148:201-4. 8. Jeanbourquin D, Cordoliani YS, Derosier C, Le Gall R, Pharaboz C, Cosnard G. Relations between neurinoma of the VIII cranial nerve and the porus of the internal auditory meatus. Apropos of 110 cases. J Radiol 1991;72:631-4. 9. Kapila K, Tewari MC, Verma K. Paragangliomas : A diagnostic dilemma on fine needle aspirates. Indian J Cancer 1993;30:152-7. 10. Scheithauer BW, Brandner S, Soffer D. Spinal paraganglioma. In: Louis DN, Ohgaki H, Weistler OD, Cavenee WK, editors. WHO Classification of Tumors of the Central Nervous System. Lyon: International Agency for Research on Cancer; 2007. p. 117-9. 11. Gruszkiewicz J, Geldner M, Brysz A. Tumour of the glomus jugulare (non-chromaffin paraganglioma) of the ponto-cerebellar angle treated with x-irradiation. J Neurol Neurosurg Psychiatry 1963;26:90-3. 12. Suárez C, Rodrigo JP, Bödeker CC, Llorente JL, Silver CE, Jansen JC, et al. Jugular and vagal paragangliomas: Systematic study of management with surgery and radiotherapy. Head Neck, 2012 [Epub ahead of print].